The Graduate School provides Application Fee Waivers for prospective targeted graduate students including those who have participated in a summer research (REU), MARC or McNair program or are from a low-income family. Email Martha Reck (mreck2@wisc.edu) for questions you might have about this. More information about the graduate school in general can be found here. The programs and resources listed below represent several options for graduate students to expand their UW-Madison experience beyond the bounds of academia. Included are resources to help connect with other students, faculty and the community. We encourage you to access the academic, social, cultural and professional development opportunities available here. The Multicultural Graduate Network is your resource for social networking, learning and professional development. Housed within the Graduate School at the University of Wisconsin-Madison, we focus on the needs of graduate students of color, and also serve as an inclusive network for ALL graduate students! The Multicultural Graduate Network (MGN), located in the Graduate School, Office of Diversity, Inclusion, and Funding brings together graduate students from across UW-Madison to foster community and relationships. We seek to address the needs of students of color through professional development opportunities, social networking, and continued dialogue. The Edward Alexander Bouchet Graduate Honor Society commemorates the first African American to earn a doctorate degree from an American university (Physics, Yale University, 1876). The Bouchet Society seeks to develop a network of scholars who exemplify academic and personal excellence, foster environments of support, and serve as examples of scholarship, leadership, character, service, and advocacy for students who have been traditionally underrepresented in the academy – exemplifying the spirit and example of Dr. Bouchet. See more about the UW-Madison Bouchet Society. UW–Madison has an outstanding McNair Scholars Program to assist undergraduates in obtaining the skills and knowledge necessary to succeed in graduate school. This national program provides research opportunities, research stipends and extensive preparation to create a bridge between undergraduate and graduate education. Each year, approximately 25 highly qualified students interested in post-graduate study participate in the McNair Scholars program. 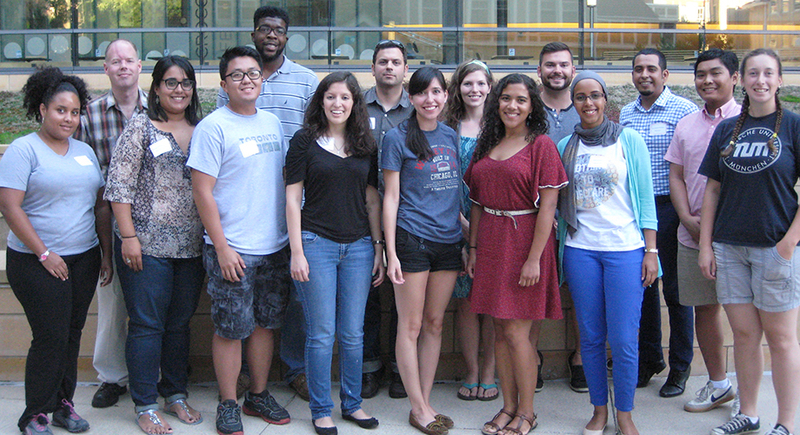 The goal of the McNair Scholars Program is to create a diverse academic environment by increasing the number of traditionally underrepresented students in UW–Madison graduate programs and ultimately the professorate.This federally-funded program accepts applicants from low-income backgrounds who are first-generation college students and targeted minority applicants. The Graduate School is invested in your success and committed to helping you build your career as a graduate student and as a professional. The professional development webpages are an essential resource, featuring planning guides, skills development tools, and career support resources to help you achieve your professional goals. We encourage you to revisit these resources again and again throughout your time at UW-Madison – from your first weeks on campus as you chart a course for success, during pivotal points in your studies and research, and as you set out on the job search. The Graduate School also works together with other units on campus to provide guidance, resources, workshops, and programs to assist you. The curated events calendar will help you stay aware of the many events and workshops that will support your efforts to develop academically and professionally. Our graduate programs attract students of diverse cultural backgrounds and more than 2,500 of our current graduate students hail from around the globe – China, India, Korea, Turkey, Taiwan, Germany, Iran and a host of other countries. UW-Madison ranks 10th among public institutions in the U.S. News & World Report’s 2012 edition of America’s Best Colleges. According to the National Research Council’s survey released in 2010, UW-Madison had 40 programs ranked in the top ten in their field. And the National Research Council found that UW-Madison has more highly rated doctoral programs than any other U.S. university.